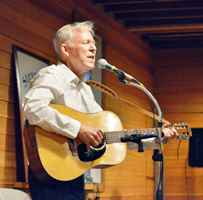 Gary Poole is a songwriter with an eye and ear for the journeys of our lives. His songs explore a world that is sometimes wildly complex and sometimes beautifully simple. In the early stages of his career, Gary was a creative force behind the group Marilyn, Hudson, Carr and Poole, writing their hit singles "For Today" and "Is it any wonder?" Today, Gary is writing and performing with the same passion that defined him back then. His latest writing, featured in the collection "Songs for a Curious World" runs the full gamut from grandchildren to the nature of truth in today's world. A Steveston native, Gary always loves to return to the Guild, and we are pleased to have him back. 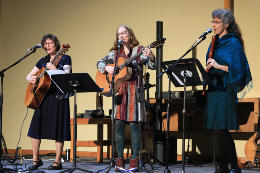 JES TRIO is Jane Slemon, Ellen van der Hoeven, and Susan Larkin. A tight braid of voices backed by a tapestry of instruments, the members of this musical friendship often can't help but get themselves mixed up with one another. 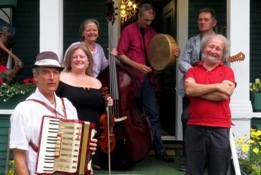 Playing for concerts, coffee houses and garden parties, JES Trio cultivates a diverse repertoire that includes celtic, folk roots, and original songs. Some of you will remember Ellen, she has performed at SFG many times over the years, on her own and with her man Tom Rawson (the banjo man). Stoo Born of Music on Main said this about Jes Trio: "If you haven't heard JES yet, you are in for a treat. This trio is a perfect example of the whole being more than the sum of its parts. Each member of the group has extensive musical experience in other collaborations and formats, each is a skilled multi-instrumentalist, a fine, strong singer, with an ear for harmonies and a taste for lyrics. Their performances change tonality and style rather like a kaleidoscope, swirling in front of you. It's going to be a great evening." I think that says it all.